When shoveling snow, lift with your legs, not your back. Step in the direction you are throwing the snow, instead of twisting at the waist. A single-stage model can clear a path about 16 to 18 inches wide. A two-stage model is a little larger and has an impeller that blows the snow out of a moveable chute. It can move more snow, but it is more expensive. 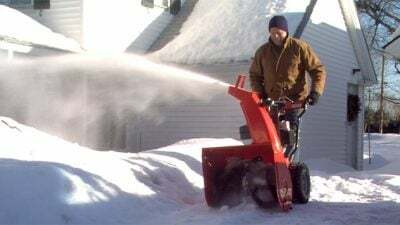 Whichever model you choose, turn off the machine completely before clearing a clog in your snowblower.